Abu Dhabi – 06 February 2019 - Insurance House P.S.C. (IH) has maintained a steady performance by registering a Net Profit of AED 10.64 million for the year 2018, which is 28.9% higher than the Net Profit of AED 8.12 million registered in the previous year. This augurs well for sustained profitable growth in the near future. The Board recommended to discuss the distribution of a cash dividend for the first time since inception, during the upcoming Annual General Meeting. Gross Premiums Written during the year ended 31 December 2018 dropped to AED 210.88 million, compared to AED 219.47 million logged during the previous year, which came as a result of systematic selection of underwritten risks and overall softening of the insurance market in the UAE. However, Net Claims Incurred during 2018 registered a dramatic but healthy drop of 20.84% down to AED 84.44 million compared to AED 106.67 million during the previous year. This is a direct result of a series of strategic and tactical measures implemented by IH Management to lower cost of Claims Incurred across all business lines. The ratio of Net Claims Incurred as a percentage of Net Premiums Earned, registered a remarkable improvement to 56.9% in 2018 compared to 67.6% in the previous year. As a result of the above, Net Underwriting Income for 2018 jumped by 24.2% to AED 45.75 million compared to AED 36.85 million registered during the previous year. With the addition of a stable rent yielding investment property in Q1 2018, Investment Income earned during 2018 rose to AED 4.36 million compared to AED 2.89 million in the previous year. Cash & cash equivalents as of 31 December 2018 stood at a robust 19.4% of Total Assets, highlighting the sound liquidity position of the Company. General and administrative expenses are higher than the previous year but in line with Insurance House’s expenditure budget for 2018. From an IT Systems and Operational perspectives, the Company transitioned smoothly to the new UAE VAT regime which came into effect on 1 January 2018. Other Operational Expenses for 2018 include a sizeable one-off expenditure of AED 2.96 million on account of Output VAT payable to FTA that was not recoverable from customers as per the UAE VAT Legislation. 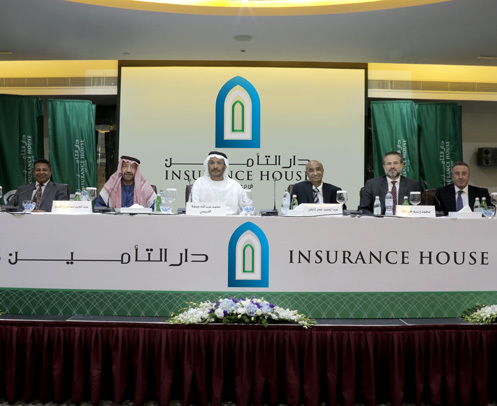 During 2018, Insurance House further expanded customer reach within the UAE through the addition of two new branches, the first in Deira, Dubai and the other inside Muroor, Abu Dhabi. This brings the total branch network in the UAE up to 8 branches, in addition to the Abu Dhabi head office.